A town in the district of the Upper Palatinate and Regensburg (Ratisbon), Bavaria; inhabited by Jews from the thirteenth century. In 1298 the town authorities ordered that the rights of the Jews be respected; but in the same year the Jewish community suffered from persecutions instigated by the leader of the peasants, Rindfleisch. The Nuremberg "Martyrologium" gives the names of the following who died there for the faith: Kalonymus ben Shabbethai and his wife Gutlin; Judlin, his wife, step-daughter, and two children; Baruch ben Jehiel ha-Kohen, his wife Minna, and two children; Lemlin ben Baruch, a young teacher; Gershon ben Solomon ha-Levi; Moses ben Israel. In 1364 permission was given to Sussmann," Hochmeister" of the Jews in Regensburg, to keep a school in Amberg; and in 1366 the Jews of that town obtained the same rights as their brethren in Heidelberg. In 1369 one Bendit and his son Noel were received into the community for three years without the payment of any tax. The same privilege was extended to the "Hochmeister" Mosse of Wene (Wien? ), who also received permission to establish a school. All who attended his school were to be amenable only to Jewish law as interpreted by the "Hochmeister." Count Palatine Rupert promised full protection to all Jews settling in Amberg. 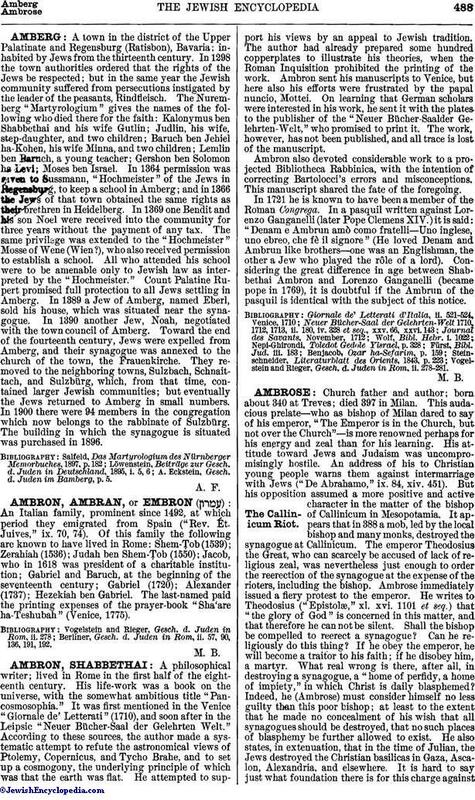 In 1389 a Jew of Amberg, named Eberl, sold his house, which was situated near the synagogue. In 1390 another Jew, Noah, negotiated with the town council of Amberg. Toward the end of the fourteenth century, Jews were expelled from Amberg, and their synagogue was annexed to the church of the town, the Frauenkirche. They removed to the neighboring towns, Sulzbach, Schnaittach, and Sulzbürg, which, from that time, contained larger Jewish communities; but eventually the Jews returned to Amberg in small numbers. In 1900 there were 94 members in the congregation which now belongs to the rabbinate of Sulzbürg. The building in which the synagogue is situated was purchased in 1896. A. Eckstein, Gesch. d. Juden im Bamberg, p. 5.